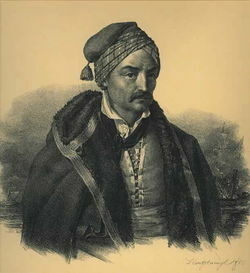 Konstantinos Kanaris (or Canaris, Greek: Κωνσταντίνος Κανάρης) (1793 or 1795 – September 2, 1877) was a Greek admiral, freedom fighter and politician. Miltiades Kanaris, (1822–1899) - Admiral, member of the Greek Parliament, and government minister. Lycurgus Kanaris (1826–1865) - Lawyer. Aristides Kanaris, (1831–1863) - Navy officer. Thrasybulos Kanaris, (1834–1898) - Admiral. Constantine gained his fame during the Greek War of Independence (1821–1829). Unlike most other prominent figures of the War, he had never been initiated in the Filiki Eteria (Friendly Society). The Friendly Society, founded at September 14, 1814 in Odessa by three traders, was mainly responsible for planning the revolution against the Ottoman Empire and recruiting supporters for it. Its founders being members of the Freemasonry, they had adopted their methods of initiation, organising and assuring secrecy from it. By early 1821, it had gained enough support to declare a revolution. This declaration seems to have surprised Constantine, who was absent at Odessa. He returned to Psara in haste and was there when the island joined the Revolution on April 10, 1821. The island formed its own fleet of ships and the famed seamen of Psara, already known for their successful naval combats against pirates and their well-equipped ships, proved to be effective at full naval war. Constantine soon distinguished himself as a fire ship captain. 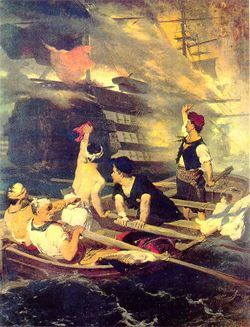 Notably at Chios, where on the night of June 6/June 7, 1822 forces under his command destroyed the flagship of the Turkish admiral Pasha Kara-Ali in revenge for the Massacre of Chios. The admiral was holding a celebration, while Kanaris and his men managed to place a fire ship next to it. When the flagships' powder keg caught fire, all men aboard were instantly killed. The Ottoman casualties consisted of 2000 men, both naval officers and common sailors, as well as Kara-Ali himself. Constantine led three further successful attacks against the Turkish fleet in 1822-1824. But during this last year, the fate of both Kanaris and his island took a turn for the worst. Egypt was namely a province of the Ottoman Empire at the time but its viceroy Mohammad Ali (1769–1849), had earned enough power to act independently from the Sultan and had formed his own army and naval fleet. It was headed by his adoptive son Ibrahim Pasha (1789–1848). The later had hired a number of veteran French officers - who had served under Emperor Napoleon I of France and were discharged from the French army following his defeat - to help organise the new army. By 1824 it counted 100,000 men and was both better organised and better equipped than the Sultan's army. Sultan Mahmud II offered to the viceroy the command of Crete, if he agreed to send part of this army against the Greeks. They quickly reached an agreement. The Egyptian army, under the personal command of Ibrahim Pasha, started a successful campaign in both land and sea against the relatively ill-equipped, disorganized and outnumbered Greeks. Among other victories, the Egyptian fleet managed to capture Psara on June 21, 1824. A part of the population managed to flee the island, but those who didn't were either sold into slavery or slaughtered. The island was deserted and surviving islanders were scattered through what is now Southern Greece. After the destruction of his home island, Constantine continued to lead his men into attacks with minor successes. Despite them, Ibrahim Pasha would be virtually undefeated until the Battle of Navarino of October 20, 1827. Then the Egyptian fleet was destroyed by the combined naval forces of Britain, France and Russia, that had taken the Greeks under their "protection". Following the end of the War and the independence of Greece, Constantine became an officer of the new Greek Navy reaching the rank of Admiral and later a politician. Kanaris served as Minister in various governments and then as Prime Minister from March 11- April 11, 1844. He served a second term (October 27, 1848 – December 24, 1849) and a third (May 28, 1854 – July 29, 1854). In 1862 he was one of the few War of Independence veterans that helped in the bloodless revolution that deposed King Otto of Greece and put Prince William of Denmark on the Greek throne as King George I of Greece. Under George I, he served as a prime minister for a fourth term (March 17 – April 28, 1864), fifth term (August 7, 1864 – February 9, 1865) and sixth and last term (June 7 – September 2, 1877). Following his death his government remained in power until September 14, 1877 without agreeing on a replacement at its head. He was buried in the First Cemetery of Athens, where most Greek prime ministers and celebrated figures are also buried. After his death he was honored as a national hero. He is thought to be distantly related to Wilhelm Canaris, head of the German Abwehr during World War II, but the exact genealogical connection remains uncertain. This page was last edited on October 10, 2006, at 15:45.